"The Birth of Christ." The Cathedral of St. Andrew, Grand Rapids, MI. 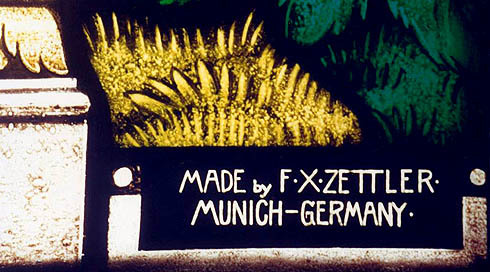 F. X. Zettler, Munich, ca. 1912. MSGC 95.0028. Photos by Thomas R. Bochniak. St. Michael. Unknown maker, 1876. Cathedral of St. Andrew, Grand Rapids, MI. MSGC 95.0028. Photo by Thomas R. Bochniak. This St. Michael window is one of several windows that survived St. Andrew's fire of 1901. 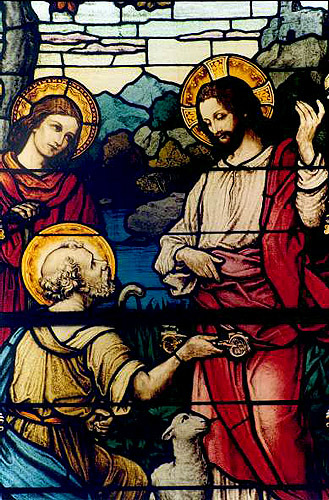 Left: "The Giving of the Keys to Peter" (detail). Attributed to Franz Mayer & Co., ca. 1915. Cathedral of St. Andrew, Grand Rapids, MI. MSGC 95.0028. Photo by Thomas R. Bochniak. Right: "The Raising of Lazarus (detail)." Attributed to Franz Mayer & Co., ca. 1915. Cathedral of St. Andrew, Grand Rapids, MI. MSGC 95.0028. Photo by Thomas R. Bochniak. 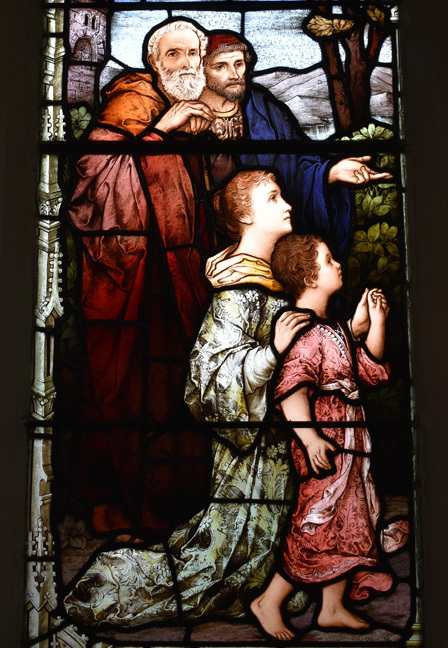 Mayer and Zettler worked in the popular "Munich pictorial style" of stained glass10 that appeared in many American churches in the late nineteenth and early twentieth centuries. The style developed out of the Royal Bavarian Stained Glass Establishment (Konigliche Glasmalereianstalt) in 1827 under Ludwig I of Bavaria. Other Munich or Munich-style firms of the time included Tiroler Glasmalereianstalt (Innsbruck, Austria), van Treeck (Munich), Fred Müller (Quinlinberg), Gassen & Blaschke (Düsseldorf) and George Boos (Munich), although the style's popularity led to its adoption by many non-German studios as well.11 With regard to windows identified in Michigan as "Munich Style," we are primarily referring to works by Mayer and Zettler, although additional buildings from this period have been identified with windows by Tyrolean Stained Glass (Tiroler Glasmalereianstalt) and other German studios. There are fourteen buildings in Michigan with windows attributed to Mayer & Co. of Munich, and six with windows attributed to F.X. Zettler. These buildings can be found in communities both large and small. Left: "Suffer the Little Children to Come Unto Me" (detail). Franz Mayer & Co., 1905. Christ (Episcopal) Church, Detroit, MI. MSGC 93.0109. Photo by Josephine Zedan. 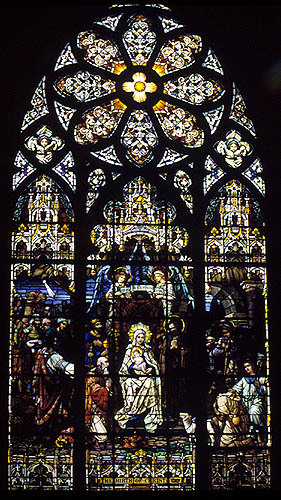 Probably one of the most notable Mayer windows to be found in the state would be the "Lyster Window" from Christ Church, Detroit. 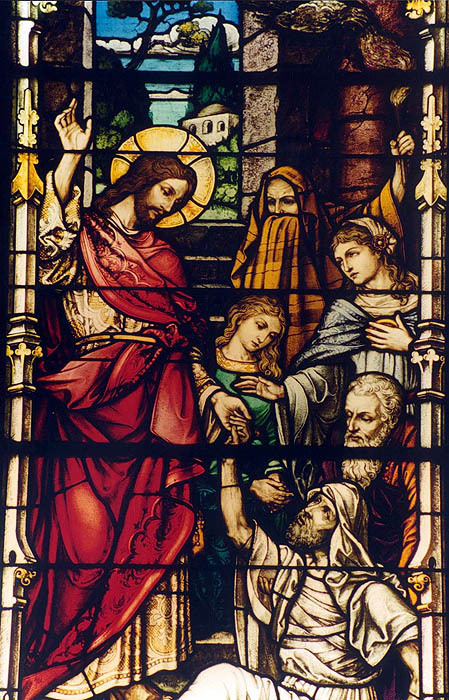 The tri-lancet scene with a central figure of Christ features figures painted from the likenesses of the family of Dr. Francis Lyster, donor of the window. The elder male figure here represents William Narcissus Lyster, the first rector of Christ Church. 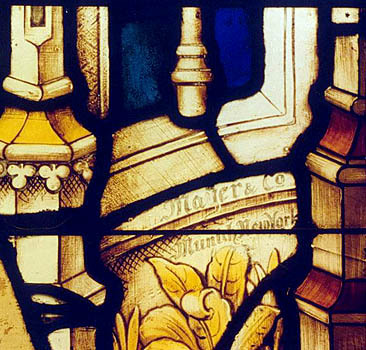 Francis Lyster is next to him.12 Right: Nativity Window (detail). Franz Mayer & Co., date unknown. Cathedral Church of St. Paul (Episcopal, built 1911), Detroit, MI. MSGC 93.0096. Photo courtesy of Nola Tutag. 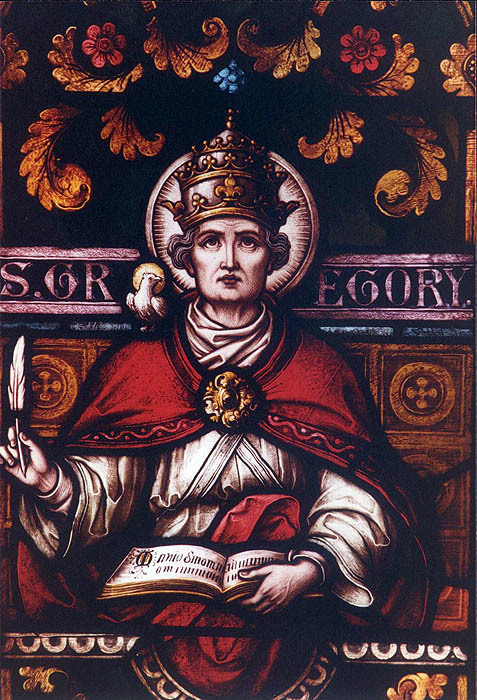 Left: St. Gregory the Great. Franz Mayer & Co., ca. 1906. St. Boniface Catholic Church (closed 1989), Detroit, MI. MSGC 93.0112. Photo by William M. Worden. A 1906 Detroit newspaper article announcing the installation of several new windows at St. Boniface stated: "Mayer & Co. of Munich are the designers and makers of the new windows, that firm being considered the leader in this line of work. The coloring is rich without being gaudy and the faces are expressive and beautiful. 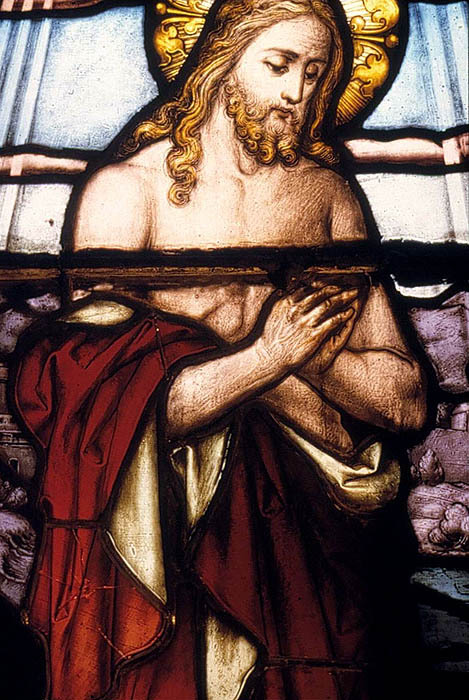 "15 Right: "Baptism of Christ" (detail). Franz Mayer & Co., 1892. Trinity Episcopal Church, Detroit, MI. MSGC 93.0162. Photo by Barbara Krueger. The cachet for American clients of having windows from European studios is evident even today as we try to retrace the provenance of windows from both American and European makers. An attribution we encounter occasionally from churches is that of windows originating from "Munich" or "Germany." While this is no doubt plausible from the visual attributes of many windows, documentation itself often does not survive in any form other than in church lore. While there are many unsigned windows in Michigan that are absolutely painted in what could be described as the Munich style, without signatures or documentation of provenance there is no way of confirm whether the windows came from German makers, or from any number of American contemporaries who were working in the popular style and employing their own German-born and trained glass painters. 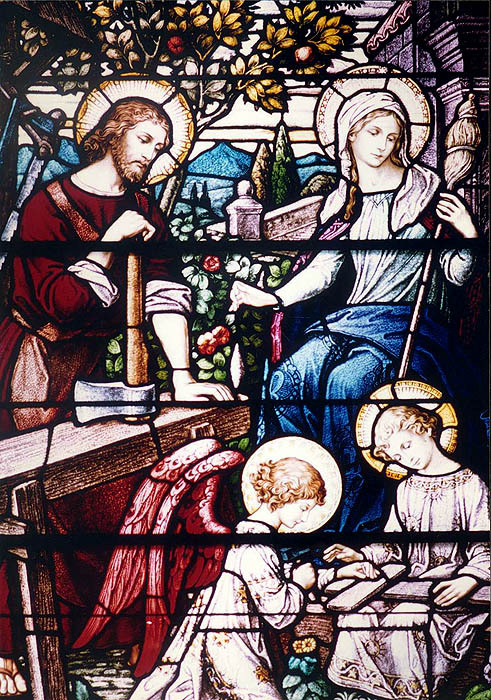 Holy Family Window (detail). F.X. Zettler, 1925. Holy Rosary Church, Cedar, MI. MSGC 95.0072. Photo courtesy of Leona Witkowski, Pamela Lieurance and Pam Novak. We should note that the Munich pictorial style is not to everyone's taste, and it certainly has had its detractors over the years. Frueh remarks that some find the subject matter overly sentimental,18 while James Sturm notes that critics of the style find it overly embellished and sometimes poorly executed on a technical level. Simply viewing the several examples of windows we have shown here, we can see the hand of different painters at work and, consequently, the variation in skill between them.19 Whatever our individual tastes may be, or the technical merits or flaws of particular windows, the fact remains that this work is found in many fine churches and cathedrals around the world for a reason. It represents an aesthetic that was evidently prized in its time for its craftsmanship and opulance as well as for its ability to engage the viewer emotionally and spiritually. 1McGee, John Whalen. The Catholic Church in the Grand River Valley, 1833-1950. Grand Rapids, MI: [s.n. ], 1950, p. 30. 2The history of the Catholic church in the Grand Rapids area as it relates to early settlement of the region is recounted in excellent detail in McGee, especially chapters 2-3. 5ibid., p. 219. McGee notes the windows' dedication and all of the donors' names, apparently quoted from The Grand Rapids Enquirer's account of the church dedication from December 20, 1876. 6ibid., p. 217. McGee does not indicate who the maker of the original windows was. Several old windows survived the fire, including a rose window, a window of St. Matthew, and windows of the archangels Raphael and Gabriel. ibid., p. 278. 9In addition to the 1876 unidentified windows and the windows by Mayer and Zettler, St. Andrew's also has a series of contemporary windows completed for its St. Ambrose Chapel in 1963-64 by Byron White of Grand Rapids Art Glass. 10Farnsworth, Jean M. "Biographical Sketches of Stained-Glass Studios and Selected Artists," in Farnsworth, Jean M., Carmen R. Croce, and Joseph F. Chorpenning. Stained Glass in Catholic Philadelphia. Philadelphia: Saint Joseph's University Press, 2002: 441; 457. 11Farnsworth, Jean M. "Stained Glass in the Philadelphia Archdiocese: Reflections of Faith and Culture," in Farnsworth, Jean M., Carmen R. Croce, and Joseph F. Chorpenning. Stained Glass in Catholic Philadelphia. Philadelphia: Saint Joseph's University Press, 2002:135. Jean Farnsworth's excellent discussion of the Munich pictorial style reveals how the Catholic church was influential in its support and proliferation in American churches during this period. 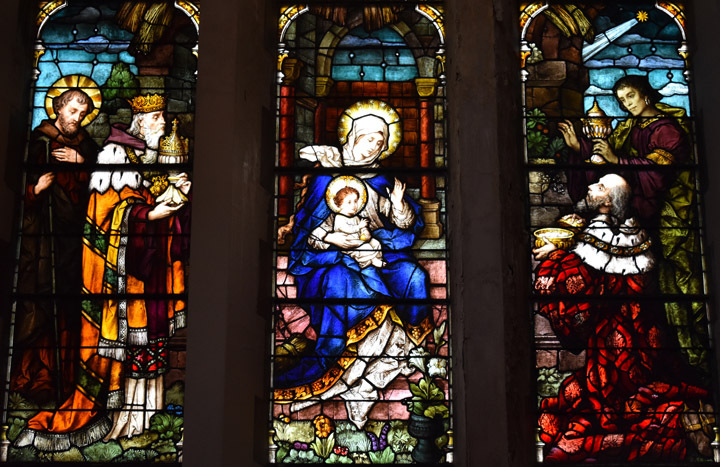 There are certainly examples of Munich style windows in some of Michigan's finest older Catholic churches and cathedrals, although they can be found in churches of other denominations, particularly Episcopalian. 12Tutag, Nola Huse with Lucy Hamilton. Discovering Stained Glass in Detroit. Detroit: Wayne State University Press, 1987, p. 49. 14Frueh, Erne R., Florence Frueh, and George Lane. Chicago Stained Glass. Chicago: Loyola University Press, 1983, p. 112. 15"Three Beautiful Scenes From the Life of Christ." Detroit Free Press. 21 March, 1906. 19Sturm, James L. Stained Glass from Medieval Times to the Present: Treasures to be Seen in New York. New York: Dutton, 1982, p. 33. 20While we have encountered numerous unsigned windows in the "Munich style" around Michigan, Mayer signatures seem to be fairly common, if not consistently applied. Variations on Mayer signatures included: Franz Mayer & Co., F. Mayer & Co., Franz Mayer of Munich, F. Mayer of Munich, Mayer of Munich, and Mayer & Co. These variations also could have included the addition of the cities of Munich, New York, London or Chicago. There is no record as to a pattern or chronology in which the variations occurred. Current opinion is that multiple representatives managing different orders from multiple offices may have influenced this, although there is no apparent way to document this easily. Nearly all of the early Munich records of Mayer were destroyed in 1944 and all of the London records are lost, although efforts are being made at present to digitize the early American records that remain. E-mail from Wilifried Jaekel to Barbara Krueger. 26 February 2007. Michigan Stained Glass Census file 98.0052, Michigan State University Museum, East Lansing, Michigan. 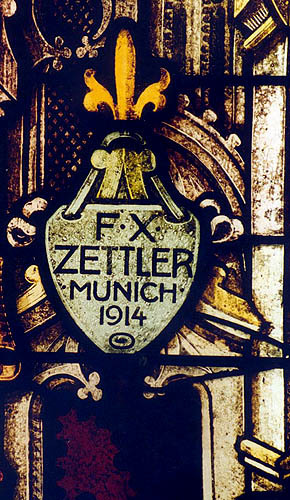 The signed Zettler windows we have seen in Michigan have simply been signed F.X Zettler Munich (or Munich, Germany), although Zettler windows in Philadelphia have been marked with the name Royal Bavarian Institute for Stained Glass. Perhaps other variations exist as with Mayer. Farnsworth, p. 457. Eckert, Kathryn Bishop. Buildings of Michigan. New York: Oxford University Press, 1993. 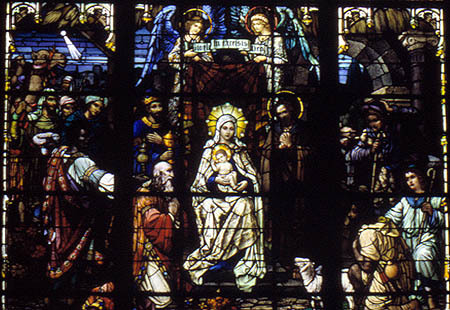 Farnsworth, Jean M. Stained Glass in Catholic Philadelphia. Philadelphia: Saint Joseph's University Press, 2002. Frueh, Erne R., Florence Frueh, and George Lane. Chicago Stained Glass. Chicago: Loyola University Press, 1983. E-mail from Wilifried Jaekel to Barbara Krueger, 26 February 2007. Michigan Stained Glass Census file 98.0052, Michigan State University Museum, East Lansing, Michigan. McGee, John Whalen. The Catholic Church in the Grand River Valley, 1833-1950. Grand Rapids, MI: [s.n. ], 1950. Sturm, James L. Stained Glass from Medieval Times to the Present: Treasures to be Seen in New York. New York: Dutton, 1982. "Three Beautiful Scenes From the Life of Christ." Detroit Free Press. 21 March, 1906. Tutag, Nola Huse with Lucy Hamilton. Discovering Stained Glass in Detroit. Detroit: Wayne State University Press, 1987. Text by Michele Beltran, Michigan Stained Glass Census, January , 2008.